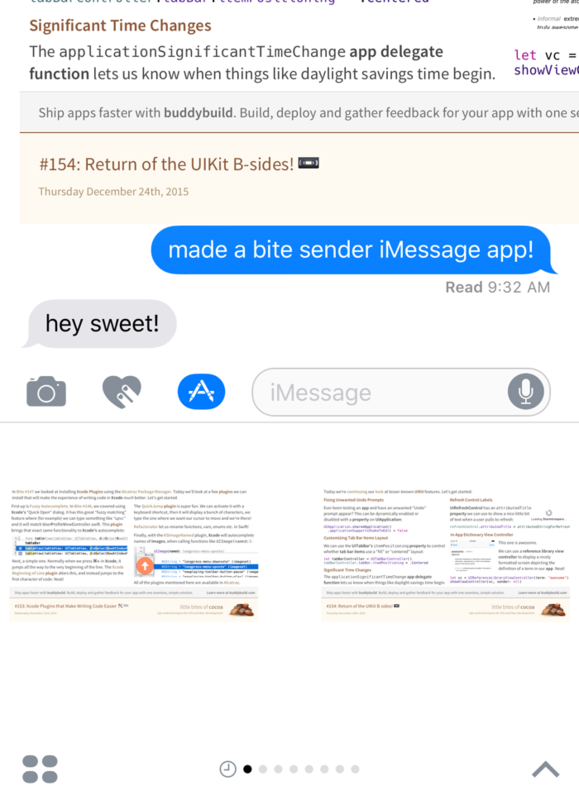 We first looked at iMessage Apps in Bite #237, when we created a Sticker Pack app. Today we'll go one step further and create an iMessage app that provides it's own UI for displaying Stickers. Let's get started. 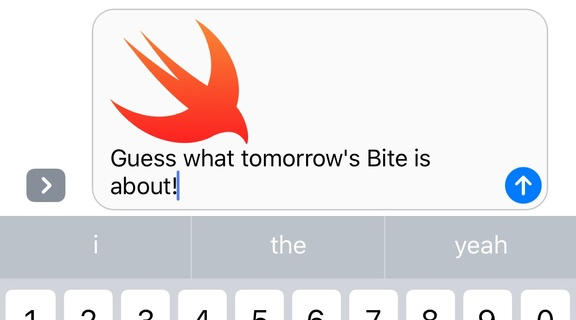 This time, we'll make an iMessage app to send Little Bites of Cocoa Bites to our friends! We'll start by creating a new Messages Application in Xcode. Then, we'll make a new file called BiteBrowserViewController.swift. We'll make it a subclass of MSStickerBrowserViewController. The loadStickers function loads Bite images from disk, then adds them as MSSticker instances. The loading plumbing code isn't important as everyone will likely be implementing this specifically for their use case. 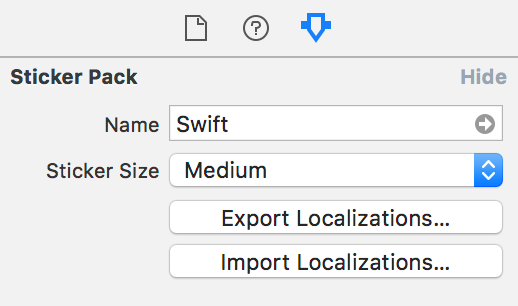 When we created our Message App, Xcode created a MessagesViewController.swift file for us. This will get shown in the UI. Finally, we'll update our Bundle Display Name in Info.plist to something like "Bite Sender". We can now Build & Run our app in Messages and start sending Bites to everyone we know! iOS 10 adds a whole new category of apps with iMessage Apps. These run inside the Messages app and can be as simple as a set of stickers or as complex as person-to-person payment system. Today we'll dip our toes into the water by creating the simplest of all iMessage Apps: a Sticker Pack App. Let's get started. To begin, we'll need to actually create the artwork for whatever we want our stickers to be. Stickers can be animated or static, and can be any of these formats: PNG, APNG, JPEG, GIF APNG, GIF. All stickers are limited to a file size of 500 KB each. We'll keep things simple and just make the Swift logo into a sticker. Now, let's actually create our app. We'll open Xcode, create a new project and choose Sticker Pack Application. We'll give our app a name, then we'll see our new project. 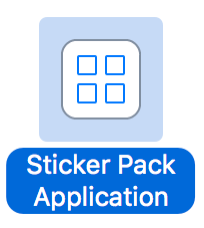 At this point, all we have to do is select the Stickers.xcstickers file in Xcode's navigation and drag and drop our image file(s) into Xcode. Last but not least, we can set a name and choose our desired sticker size in the Attributes Inspector on the right. There's Small, Medium and Large. Each one will display different depending on which device a user is running. (On @3x devices like iPhone 6S and 6S Plus, Small is 100x100, Medium is 136x136, and Large is 204x204). We can now build and run on our device, choose Messages as the app to run in, fire up a conversation, pick our new app and start sending Swift-y stickers to all our friends!